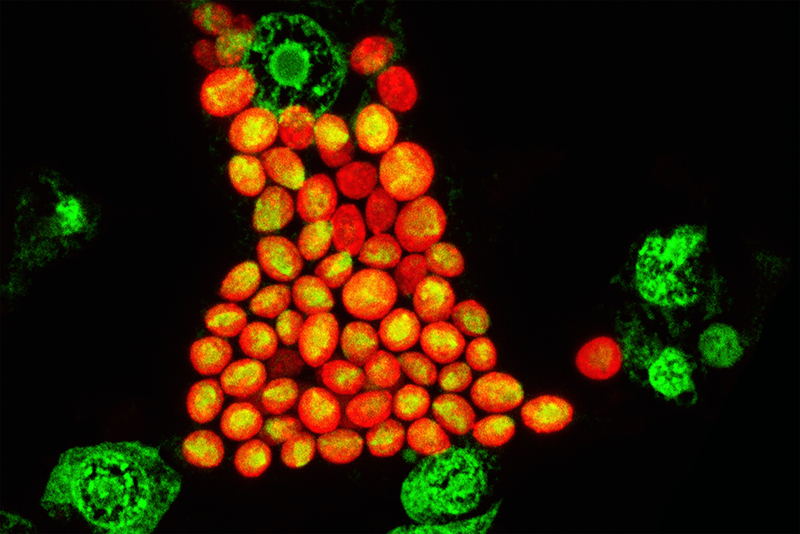 Microscopic view of Hydra-cells (nuclei appear in green) containing about 20-30 symbiotic Chlorella-algae each (in orange). In order to investigate the fundamental mechanisms of this symbiosis, the research team focused on the metabolic relationships between Hydra and its algae symbiont. The organisms live in a so-called photosynthetic symbiosis: the algae provide their host with certain metabolic products which they obtain from the conversion of solar energy. In return, they obtain nutrients from the polyps which they cannot acquire by themselves. “This form of coexistence between cnidarians and algae is an extreme form of symbiosis, in which the algae can no longer survive without their host. The symbiotic algae even give up parts of their own genetic information, and instead use the corresponding structures of the freshwater polyps,” explained Professor Thomas Bosch, cell and developmental biologist at the CAU and spokesperson for the CRC 1182, regarding the extent of the co-dependence between the species. The Hydra are also highly dependent on their symbionts, since the Chlorella colonisation boosts their reproductive success, so the organisms’ viability would be at a considerable disadvantage without the algae. A better understanding of the symbiotic relationships between cnidarians and algae is not only valuable in terms of basic scientific knowledge gained, but can also serve as a model for the assessment of climate change, associated with the change of marine ecosystems: corals, for example, are greatly threatened by the impact of global changes since their ability to absorb nutrients is dramatically affected by changes in the nutrient content of sea water. In turn, the diverse, vibrant, tropical reef-based communities depend on the health and growth of the corals. As corals – like freshwater polyps – are dependent on certain symbiotic bacteria for their nutrient uptake, a more accurate understanding of the underlying mechanisms is required. Further research is necessary to determine whether the new knowledge gained is also applicable to the symbiosis of corals and bacteria, and if this can lead to possible future adaptation strategies for protecting endangered tropical coral reefs.